Do you want to have a stress-free time enjoying the scenery while RV Camping? Do you want to buy your first motorhome knowing you paid the lowest price possible? Have you already tried full-time RV living but realized you forgot crucial details like Insurance, voting, & Mailing? Are you ready to enjoy your RV Lifestyle confidently knowing that you are doing it the best way possible? For a limited time, get this Amazon bestseller for just $7.99. (Regularly priced at $19.99). Or download it for free with your Kindle Unlimited subscription. Read on your PC, Mac, smartphone, tablet or Kindle device. Takes you through the entire process of RV living for beginners step-by-step from preparation to full time RV living, to RV Camping to celebrating around a camp fire? Answers all your questions and breaks through all the myths and misconceptions out there? Prepares you for every accident, mishap, and eventuality? Teaches you how to negotiate, buy, maintain & thrive without depending on the resources you are used to in a stationary environment? After years living the dream enjoying an RV lifestyle, traveling across all 50 states as well as finding the best boondocking places. 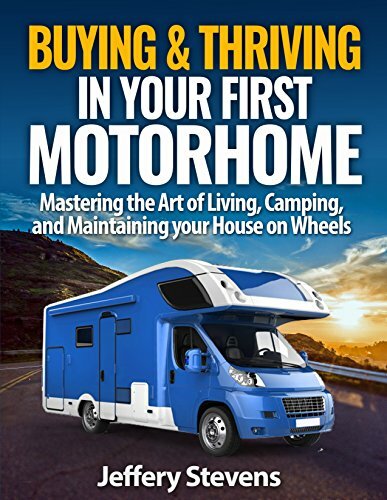 Jeffery is finally ready to reveal his unique tips, experiences & insight for living, and maintaining an RV lifestyle. This system works for every type of RV dweller. Whether you have never been RV traveling before or are about to embark on your first RV Journey, you are sure to find value in Buying & Thriving in Your First Motorhome. This book will teach you everything you need to know to get ready for the great RV lifestyle adventure, whether you are planning on full time RV living or taking a short trip doing some RV Camping. From choosing the right tools and strategies all the way through dealing maintaining your Motorhome. This is much like an RV for dummies book but with a lot less gravy and more meat! Scroll to the top and click the ‘BUY NOW’ button NOW. Download this book and click the link in the ”FREE GIFT” chapter. It’s on the last page of the book. Get the Aircraft Grade Aluminum Flashlight & Your RV Master Checklist before we run out of stock!